In her “day job,” Dr. Jefferson was a professor of surgery at Boston University Medical School and the first female doctor to be licensed to practice surgery at the former Boston University Medical Center. As the first woman surgical intern, Dr. Jefferson broke many racial and gender barriers. Though she was described as a “trailblazer” as a physician and surgeon, she will be better remembered and honored for her leadership in the pro-life movement. She was founder and president of the National Right to Life Committee (NRLC), director of Massachusetts Citizens for Life, president of the Value of Life Committee of Massachusetts, and an active member of Black Americans for Life. A colleague described her as the “greatest orator” of the pro-life movement. In testimony before Congress in 1981, Dr. Jefferson described the 1973 Roe v. Wade decision and the Doe v. Bolton decisions (which provided abortion-on-demand and struck down state restrictions on abortion) as giving “my profession almost unlimited license to kill.” We catch a glimpse of her powerful oratory in one sentence of her congressional testimony; she said, “With the obstetrician and mother becoming the worst enemy of the child and the pediatrician becoming the assassin for the family, the state must be enabled to protect the life of the child, born and unborn.” The bill that Dr. Jefferson was supporting was sponsored by two pro-life stalwarts — Senator Jesse Helms (R-North Carolina), and Rep. Henry J. Hyde (R-Illinois). The Helms-Hyde bill would have declared that human life began at conception and would have allowed states to prosecute abortion as murder. A book published in 2004, “African American Lives,” attributes her political activism to the 1970 resolution passed by the American Medical Association that stated members could ethically perform abortions in states where the procedure was legal. 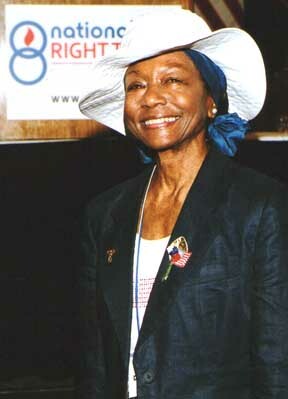 Dr. Jefferson argued that the Hippocratic Oath took precedence over the AMA and began her fight against abortion. Dr. Jefferson is reported to have served as a prosecution witness against a doctor charged with manslaughter for performing an abortion on a teenager. Dr. Jefferson was known for her passion, charisma, and eloquence. She was a sought-after speaker for numerous pro-life gatherings. Colleagues remember her smile, her hats, her attractive clothing, her reluctance to wear her glasses in public, her love of patriotic red, white, and blue costumes for political events, and her joy in life. She was described as being “a thin, diminutive, soft-spoken woman” with a “kind demeanor” and was rarely without her cowboy hat or scully cap; Jefferson was a real Texan. She was the only child of a Methodist minister, the Reverend Millard F. Jefferson, and his wife, Mrs. Guthrie (Roberts) Jefferson, who was a school teacher. Those who knew her as a youngster said she often rode along with the local doctor as he made house calls on his horse-drawn buggy. Dr. Jefferson graduated from Texas College, earned an M.A. from Tufts, and an M.D. from Harvard Medical School. She was awarded honorary degrees from twenty-eight colleges and universities. Dr. Jefferson was known for her agility — wearing ankle weights around her home and neighborhood and loving to ski — even in her 80s. Dr. Jefferson was deeply interested in all aspects of the pro-life cause. She had a career-long interest in medical jurisprudence and medical ethics. She was concerned about how the intersection of medicine and law affected contemporary issues, public policy, and public opinion. 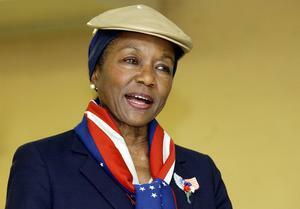 She ran unsuccessfully for political office as a GOP Senatorial candidate in 1982, 1984, and 1990. She believed that a “welfare mentality” contributed to the breakdown of the black American family — a topic researched and analyzed by CWA’s Beverly LaHaye Institute and in my book, “Children at Risk” (Transaction Publishers, 2010). Dr. Jefferson was praised for her commitment as a “political activist and recipient of numerous accolades and honors” who “devoted her talents and her life to the right-to-life movement.” She served on the Boards of Directors of more than 30 pro-life organizations. Even if we set aside her powerful and effective advocacy for the unborn, her other achievements — accomplished in truly racist times — warrant her status as an American hero deserving of our praise and highest honors.